That’s a dynamic picture ! The colours are so bright (but she really should put away her phone before to take a picture). Why do you think this is staged? It was shot at the Marni show in Milan. She looks amazing really full of life and joy! I love how vibrant and colourful this photo is. Are you sure she is really taking a photo? Beautiful! Gorgeous! I LOVE everything about this girl’s outfit, it just screams AMAZING! Wow, the print and vibrant colours on her top are gorgeous! I like her top and her nails, but what is she doing? Taking a picture of her phone? I like the picture (mostly because of the colors), but I agree that the action is a little strange. Serious crush on her Hermes bracelet!!! love the look of color with that background – awesome shot! I love how this is so natural looking… she is obviously enjoying seeing something amazing. I think the way she is holding her phone definitely shows that it wasn’t staged. This is why photographers needs pockets. Cute shot, though. the colors seem to have followed me home. either way it can’t have been a great shot, what with the iphone covering the lens and all. Staged or not, I think this pose is strange. Based on the composition (the color is beautiful), isn’t she taking a photo with her iPhone in the way? love her look! especially the jewelry! Doinac looks so beautiful. Such an endearing capture. Ah who is that?! She looks so vibrant, young, and beautiful! I love everything about her style! its youthful and fresh!! This series has become one of my all-time favorites. I look forward to seeing more. While I find it incredibly fun to shoot ‘photographers’ as well, are u suggesting that she is in fact a ‘photographer’? ?She is def cute and dexterous… are those the parameters? I love her adorable smile and hint of a dimple.. the colors are exceptional! She does look so amazing. I dig the little details. I love this picture! So brightful, colorful… amazing! So it! Oh for crying out loud, look at that darling smile and dimple. All the pretty girls indeed. I really like this post idea Scott. From an historical perspective it’s quite thrilling for me to see lots of women working in what was a traditionally male profession. Like it’s normal as rain. Go Girl Power! Dress is probably some big designer, but wild print totally reminds me of silky, nice weight rayon dress line Jams World designed that was huge rage here (Hi.) in 90′s. Lots of different bright crazy fabric, nicely fitted designs, cool, comfy yet stylish. A nice change from all the tropical flower prints that dominate here, and get tiring. So, “who is she wearing”? That single dimple barely overcomes the iPhone obscuring her lens. I love a cute girl but your photos and observations are the real draw. her iphone is covering half the lens of her camera. Beautiful shot. Does anyone know what camera she is using? gorgeous colour saturated abstract print. I don’t feel this suggests it’s “staged,” nor do I care that much if it is — it’s just a bit confusing as to what’s happening in the photo. Ugh I love this – multitasking and still adorable! noticed the Oversize Runway Watch by Michael Kors right away! Loveee it!! probably not much of a shot there with her phone in front of the lens..
sure, the phone blocking the camera lens is distracting, but i love her hair, the cut of the dress and that cute dimple. dang! Not quite sure why she’s smiling when she probably can’t see anything with her sunglasses and iPhone in the way! It’s Natalie, from Canned Fashion! Her style is so great! Love that smile, the beautiful colours, her nailcolour…. wow soooo perfect!!! Wow – I adore all the vibrant colors she is wearing! I moved to Paris two months ago, and am so surprised by all the dark, drab colors. While Paris’ inspiration is neverending, I miss happy colors! Great sense of energy and confidence with all these colours and textures, which look great combined with a neat, classic hairstyle. Great colourful printed dress. She looks very good! Very nice shot by the way. I’ve got this Marni dres and now I’ll never wear it again having seen how lovely it looks on this girl! Fantastic picture. The girl seems to have a lot of fun taking those pics. She is so pretty and cute!!! I love her colors, her dog collar bangle, the camera.. everything is just so perfect!! Gorgeous colors, and I love that cuff…but her adorable smile is the centerpiece. michael kors watches r def the prettiest!! Love the combination of red and gold. What are those sunglasses!??!?! have seen them everywhere but no idea who they’re by! Love it! The colours make me happy. is she a blogger? if so whats her site? I think “vibrant” is the only way to describe this look! Where are those amazing sunnies from? OMG this picture is amazing! she’s gorgeous…colours are so bright, love it so much! is she taking a photo of the back of her phone? She couldn’t put down her phone for one second while taking a picture? It’s in lens’ way, anyway. The colors are gorgeous, nonetheless. some expert gadget juggling going on. Maybe she’s just reviewing the photos she already took? Les couleurs sont magnifiques! I love it. cute girl but it’s impossible to believe she’s any kind of photographer wearing sunglasses with her phone covering the lens. Her dress is like an abstract painting and I love her hair, but what I like the most about this picture is the position of her hands, kind of dramatic as though she was dancing. Perceptions. I love the colors. Her nails, her top….and I love the way she holds all of her tools….it’s so casual…and textural. I love that her hair is collected, and smooth. The photo is full of colours!! !So Beautiful!! Great shot! love the colours and her watch!!! and the way shes holding her fone and taking a shot_! Fabulous colors. I love her energy too – you can tell she’s excited about whatever she’s photographing. Is it Donia from the golden diamonds blog? Love her style!!! Great photo. Hmm I like the look of that camera, it’s a good size! Anyone know what model it is? What a gorgeous smile to match a gorgeous top! I have never posted a comment on an internet blog before, but this photograph, as well as the one of Bill Cunningham, are two of the most fantastic works of art I have ever seen. Bravo!! p.s. I adore your photos Scott! I’m checking here everyday to get some inspiration in my office -with lots of papers on my table:) This blog is like a daily inspiration breeze to me! p.s. Garance is still my favorite so far! Cute as dimple! Happiness is the most attractive fashion asset in my book. She looks so cute and happy ! I love her smile and the colors of the photography ! the 60′s bursting out in camera form, wonderful! yeah parfait !! j’adore ! love this girls style – her clothes and style is so vibrant! i check & follow her blog often! If you can’t put your phone down to snap a photo, err I don’t know…. People get over it and apprecciate the picture and his effort to take it. Lovely lady wearing great accessories and the colors are divine, the hair shiny and polished. The girl is adorable. Everytime you take a picture like this (man or woman), I always wonder what shoes they paired with the outfit. :) Lovely. I think in photography there is some rule called the 2/3 rd rule, and I would say this photo fits into that rule, the tight edited shot, one does while taking the photo, is a measure of a good photographer, and of course the self styling makes it strong also…..
Where are those sunglasses from??!! great smile! I totally love this! Is that the girl from Swedish love affair? If so, she has never looked so good. That dress really must be good for her coloring. Usually she looks quite different. I really have a hard time wearing so many colors, but maybe it does brighten up your complexion. I own the same kind of camera and I can’t help feeling that the girl in the picture is somewhat awkward. The viewfinder on Canon’s G series has no purpose but an aesthetic one, as you’ll realize once you try taking a picture by looking through one. She is, at the very least, aware of the fact that she is being photographed and her awkward pose certainly makes me uncomfortable. This blog, however, isn’t about photography, and I certainly don’t ask for professionalism with models on the street. think thats the same Michael Kors watch i have! Im just in love with the bracelet! I think this a gorgeous, fun photo! The lady looks likes she’s having a great time (very cheeky!) 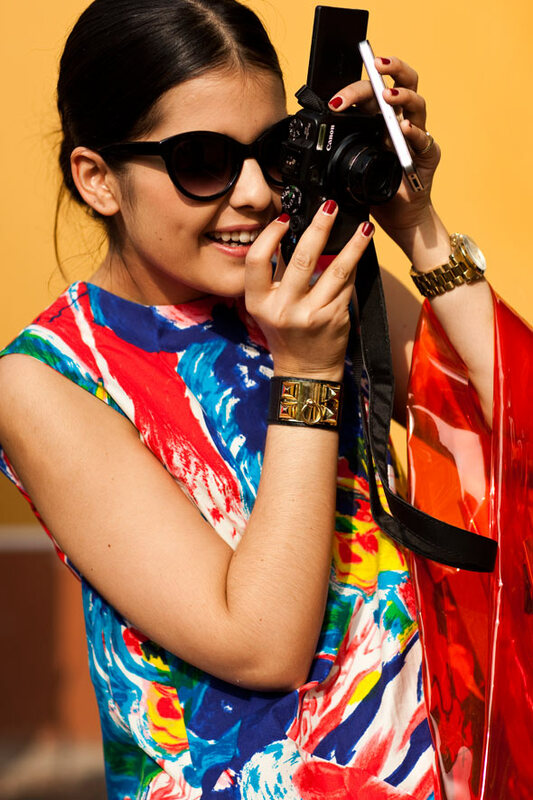 and I love the vibrant colours…..
What Camera model is she holding? Love it. Does anyone know who those sunglasses are by? Thanks!! @Livia; Thank you. Whoops. I see it now. The reason this photo can be “staged” is that 1) the phone is blocking most of the lens and 2) the screen for the camera is flipped up and she appears to be looking at the back,not the screen.The camera looks to be one of the Canon G series most likely the G11 or G12.Her finger isn’t even on the shutter button,maybe she was just preparing to take a photo.Either was,she’s quite cute.Can’t take that away from her. This is so me. I often have multiple cameras in my hands. Love the contrast and the saturation of this image! I love the punch in the colour! So many ‘grey colour’ like vintage or ‘film preset’ this days that it is refreshing to see a bit of colour!